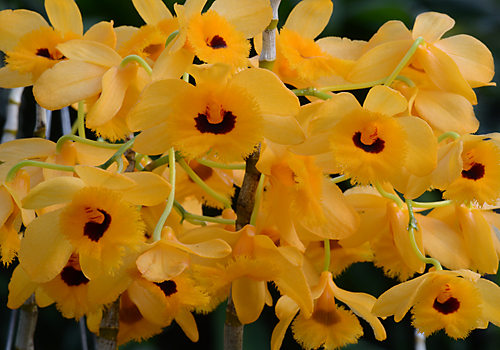 I wasn't kidding about the dendrobiums. We have lots in flower. The only down side to these wonderful orchids is that their flowers don't last long--about a week. So be sure to stop by soon, or you will have missed them. 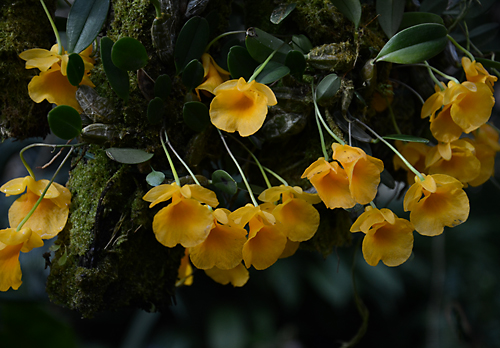 Dendrobium lindleyi enjoys growing on tree fern fiber slabs (above). 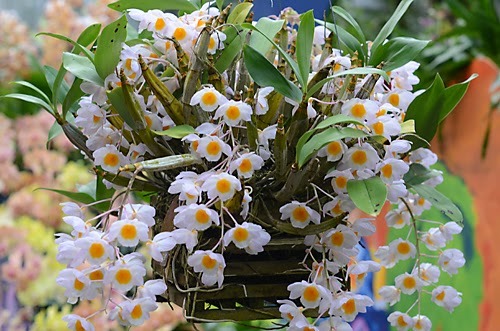 Dendrobium moschatum var. oculatum produces huge bundles of cheddar cheese colored flowers at the end of long upright canes. Notice the fringe on the lip. The variety oculatum has a maroon blotch at the base of the lip. Dendrobium farmeri, another spring bulb wannabee, photographed with the Orchid Daze display in the background. All three of the above species are native to upland areas around the Himalayas and southeast Asia, and so require a cool dry rest in winter in order to initiate buds. 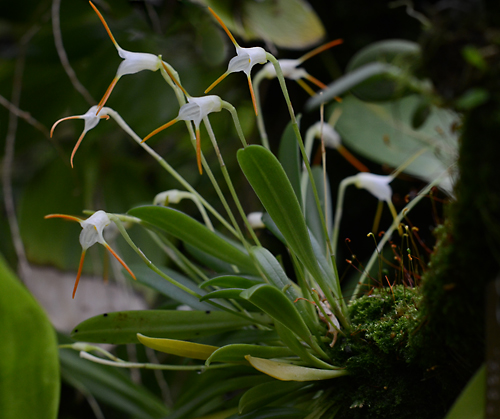 Here's the wild card: Masdevallia scabrilinguis, flowering in the Tropical High Elevation House. I couldn't resist including it. Super cute and super tiny--look carefully for miniature orchids growing epiphytically in the trees in the High Elevation House!